Pallets have ease out many home tasks for you other than just building the lovely furniture and decor objects. Like hiding the trash cans in the houses is a tangling problem especially for the ladies as they think it damaging for their DIY home decor. Especially the big trash cans standing in our outdoor portions can really prove to be a stigma to the garden decor. 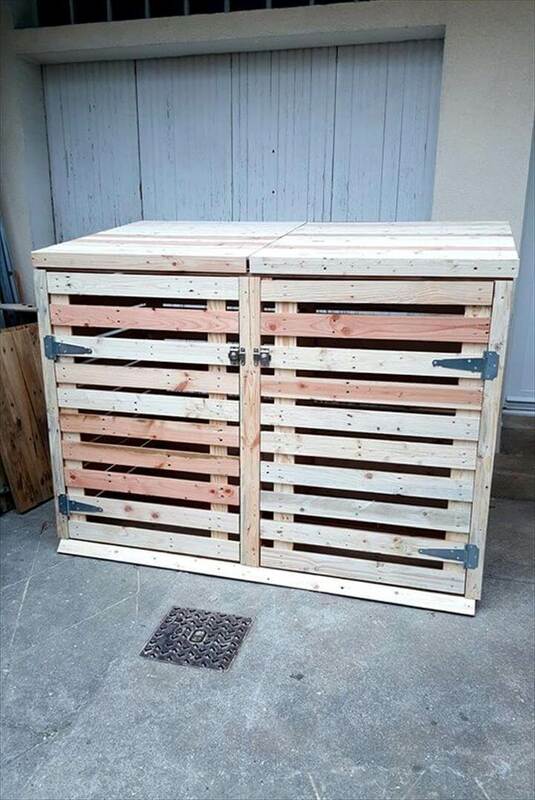 With pallets you can even solve this problem too by building this DIY pallet trash can cabinet for your outdoor places and hiding the garbage baskets in a stylish way. Just cut down the pallets into larger plank pieces and start stacking them together forming the base, four sides and the roof of the cabinet respectively. The cabinet has been divided into two sections and thus you can two hold two trash cans at the same time. 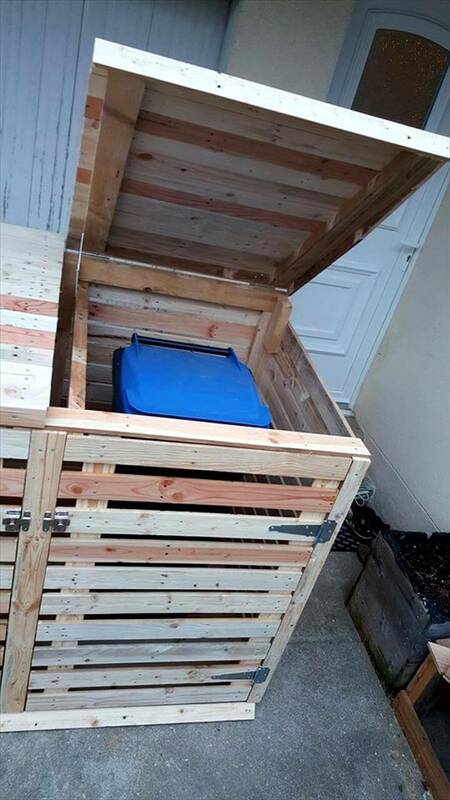 Or you can use one side space to house the bin and other to hold your garden tools or such stuff. The locks at the front make it really safe for use so that the kids and pets cannot approach it. You can stain in making it look more complementary for your spaces. This trash cabinet would be easy to build but first of all cut down the pallets into the slat or plank pieces to start up the structure with. First of build the base stacking the pallets then raise the back and the two sides with the same stacking method of planks. Joining the pallet slats together with nails the doors would be built and then joined to the cabinet using the metal hinges at two points. Here is how this lovely and functional trash can cabinet would look after getting finished with locks at the doors adding more practicality to it. 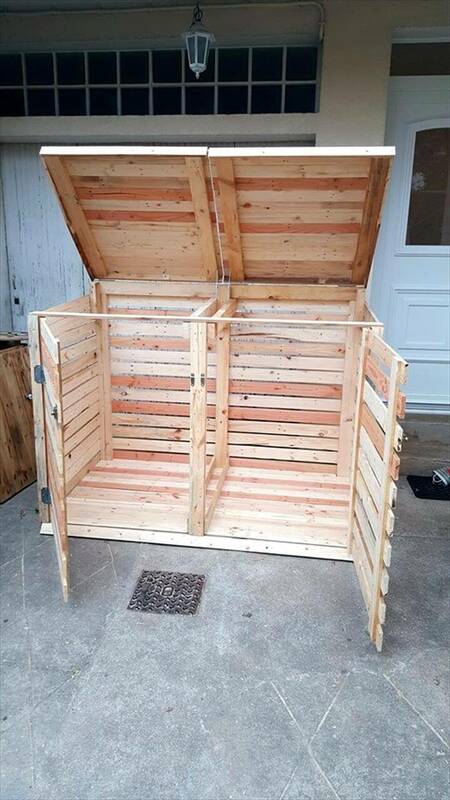 It has two sections to hold your trash cans separately in each one if your have two bins to hide from your outdoor spaces. If you have one trash can you can use the other section for the storage of other knick knack stuff you like and staining is also optional.